A few years ago, Reidun Horvei, a well known classical trained folksinger from Voss in Hordaland, made the long journey from Norway to Seattle to do research for her project Migrasong, an original Norwegian folk musical that would chronicle the emigrant journey from Norway to America. As president of the Seattle-Bergen Sister City Association and a musician who had worked with the Scandinavian immigrant repertory, I was fortunate enough to be invited to meet with Reidun. With so much in common, a friendship ensued, resulting in several trips across the Atlantic and many fruitful collaborations. In 2017, the Seattle-Bergen Sister City Association was ready to do something big for their 50-year golden jubilee celebration, and I knew it was time to bring Reidun, one of Bergen’s most beloved performers, back to Seattle. We were also celebrating the birthday of Edvard Grieg, Norway and Bergen’s most famous composer. Reidun was well versed in the Grieg repertory, much of which is based on folk melodies, and a concept for a program at Seattle’s historical Ballard First Lutheran Church emerged. Reidun brought along pianist Inger-Kristine Riber, also a Grieg expert, and in Seattle, we put together a festival quartet with some of our best young professionals. Together, they turned out to be an ensemble from heaven. Virtually every aspect of the program was executed to perfection to an enthusiastic audience that gave one standing ovation after another. The musicianship of the string quartet did not go unnoticed, and before the afternoon was over, it was clear: the Seattle-Bergen String Quartet needed to come to Norway to perform. It was an exciting prospect, and the Seattle-Bergen Sister City Association was soon on board for a new adventure. 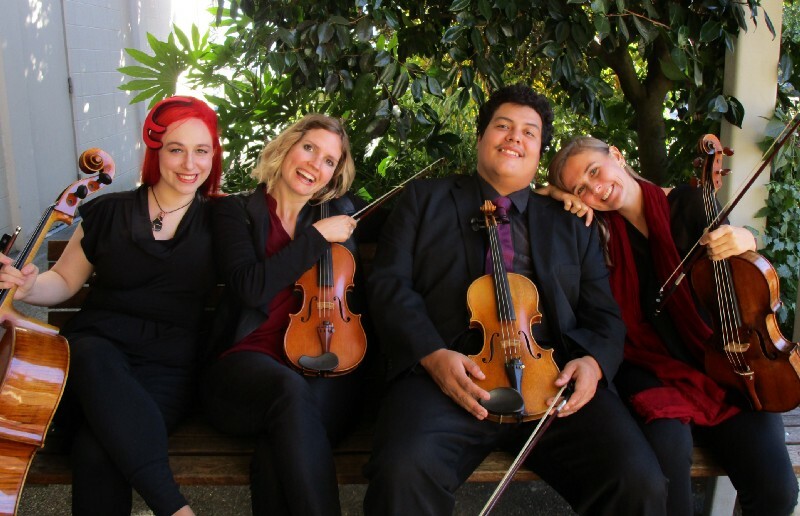 The result is the 2018 week-long Norway tour in November in which the Seattle-Bergen quartet - Allion Salvador (first violin), Rachel Nesvig (second violin), Aleida Gehrels (viola), and Zoë Kohen Ley (cello) - will team up with Horvei and Riber for a holiday concert and CD recording of some of Norway’s most beloved Christmas music. The group will make appearances throughout Hordaland County, culminating in a free concert for the citizens of Bergen at the city’s historic St. John Church on November 28. 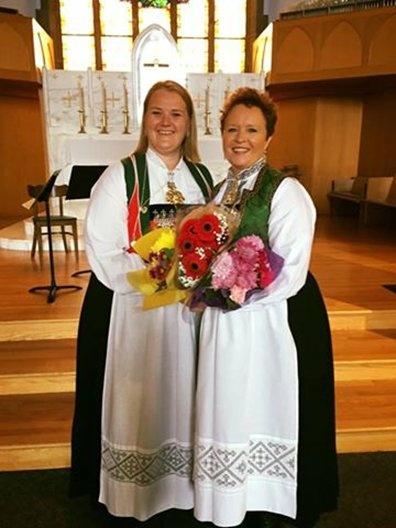 The church is already booked at capacity, and Lord Mayor Marte Mjøs Persen will be there to welcome her constituents and their visitors from Seattle. Fortunately for those in Seattle, the dress rehearsal for the Norway tour will take place in the Emerald City. Horvei and Riber will be traveling to the U.S. to prepare for the concerts, with several special events on their schedule. On Saturday, November 17, they will present a workshop on Nordic folk music techniques with Seattle Lilla Spelmanslag, a group of young Nordic folk fiddlers. The following day, the kids will be joining the two Norwegian guest artists with the Seattle-Bergen String Quartet for Vintersong, a free community concert at Ballard First Lutheran Church, 2006 N.W. 65th St., at 3:30 p.m., sponsored by the Seattle-Bergen Sister City Association, the Northwest Edvard Grieg Society, Frihet Lodge 901 of the Vasa Order of America, Seattle Lilla Spelmanslag, and the Jane Isakson Lea Foundation. Everyone is welcome, with tickets available at the door, but reservations are encouraged. The group is also raising money to fund the transatlantic tour, with donations being accepted here. Click here for more information about the Seattle-Norway tour. No Replies to "Seattle String Quartet Bergen Bound: A Sister Cities Musical Exchange"